Apples are great for weight loss since they are rich in phytonutrients and in fiber that help regulate blood sugar levels and keep you feeling full for longer. This is a healthy apple pie. You can make it sugar free by exchanging the maple syrup with stevia. Grind walnuts in a food processor, add the coconut oil and dates and grind again until smooth. Press the nut, date and flaxseed mixture on the base of a round baking tray. 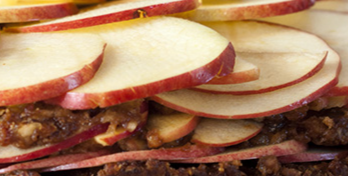 Peel and thinly slice apples into crescent shape slices. Place in a bowl. Add maple syrup, lemon juice and cinnamon into bowl and gently stir together not breaking apples. Allow mixture to stand until apples become softer (about 5 minutes). Neatly place apples on jam in the shape of a fan until whole cake is covered. Place in refrigerator for 20 minutes before serving. I hope you enjoyed this recipe. If you are serious about improving your health no matter what your age or circumstance are, and are ready to achieve better results with your weight loss attempts, guaranteed, then join my mailing list where you will receive my weekly newsletter with groundbreaking health, motivational content, recipes, supplement recommendations, easy workouts, as well as many FREE bonuses and special offers. Click HERE to subscribe. Or visit the Guerrilla Diet Website for my health advice, offers, programs and free information HERE.